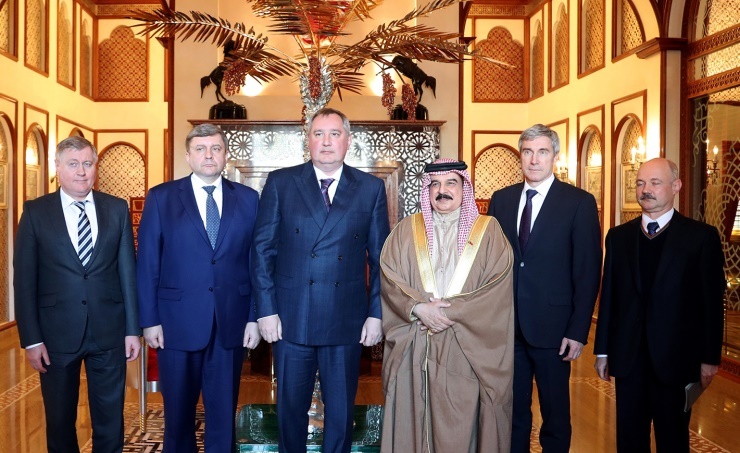 Manama, Feb. 12(BNA): His Majesty King Hamad bin Isa Al-Khalifa today received at Al-Safriya Palace, the director-general of the Roscosmos State Corporation for Space Activities Dmitry Rogozin, currently on visit to the Kingdom of Bahrain. HM the King hailed solid historic friendship binding the two friendly countries, stressing Bahrain’s keenness on expanding cooperation with the Russian Federation, particularly in the field of peaceful space researches, and benefiting from the Russian space strides towards achieving shared interests. HM the King hailed the achievements of Bahrain’s National Space Science Agency (NSSA), as well as efforts to develop national competencies towards consolidating the Kingdom’s standing the field of space sciences. HM the King commended the advanced level of joint cooperation in the field of training, stressing the framework memorandum of understanding between the National Space Science Agency and Roscosmos. He commended the crucial role played by Russian President Vladimir Putin to consolidate bilateral relations, hailing Russian strides in all fields, particularly the sector of space sciences, wishing the Russian Federation and its friendly people further progress and prosperity. Roscosmos director-general expressed thanks and appreciation to HM the King for the warm welcome, hailing royal support to joint cooperation with the Russian Federation on all levels, particularly space science researches.